Is That An Ice Pack In Your Underwear, Or Are You Just Happy To See Me? Male infertility is a serious issue, accounting for 40% of all infertility cases. So, you might think that it’s rather insensitive of me, via the title of this post, to joke about the new fertility-enhancement-through-refrigeration underwear by Procreativity. 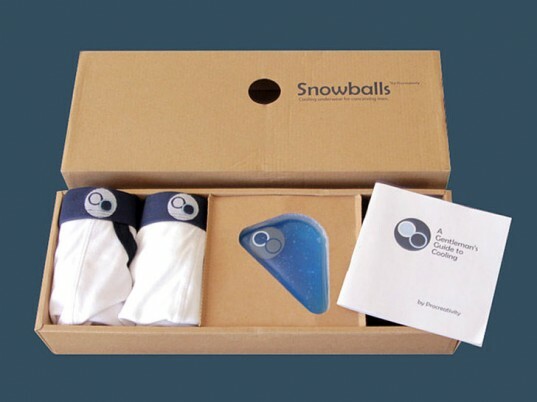 But, when you consider that the folks at Procreativity have actually branded their product with the name Snowballs, you can see that they have already beaten me to the punch. Snowballs creator Joshua Shoemake had trouble in the “fertility factory” with his wife. Too many appointments and too much money spent were taking its toll. A friend going through a similar situation was told to put some ice down below, since elevated scrotal temperature can be a major cause of infertility. The specially designed underwear include SnowWedges for cooling. The wedges mold to the body and use a freezable, non-toxic gel to maintain a comfortable temperature for 30 minutes. I think that their preemptive use of humor in naming the underwear Snowballs and the video below is brilliant marketing, recognizing that, people being people, jokes would be predictable. And, while I shiver at the thought of ice in my underwear, having had personal experience with procreation and the incredible joy of being a parent, I can’t help hope that this product can make that experience possible for more men who want it. ‹ PreviousBellingham’s Coal Train Blues: China, Please Hurry Up!